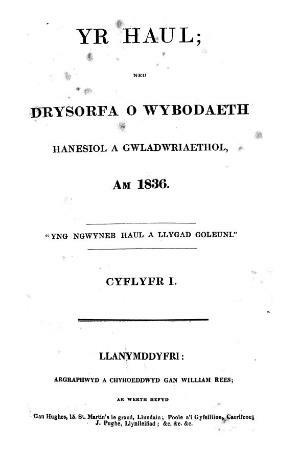 A Welsh language religious and general periodical serving the Established Church. The periodical's main contents were articles on religion, current affairs and literature, alongside reviews and poetry. Originally a monthly publication it was published quarterly from 1947 onwards. Amongst the periodical's editors were David Owen (Brutus, 1795-1866), William Spurrell (1813-1889) and Henry Thomas (1881-1973). Associated titles: The Carmarthen Chronicle and Haul Advertiser (1860); Yr Haul a'r Gangell (1953).